My awareness of Ritz Beverage Co. came from flipping through stuff at Green Shag on Manchester Avenue in the Cheltenham Neighborhood. Green Shag Market is one of our favorite routine visits. We're both sentimental and this is one of the rare antique places you can actually afford to buy stuff. Or maybe, that things are priced reasonably when you know it comes from garage, alley, yard and estate sales that people get for nothing. You can walk in with a couple fins in your pocket and leave with something that means something to you. There are good sales tactics on display. People are smart enough to cut up an ad and put mass produced items in a plastic bag with a cardboard backer and make it look collectible. I'm a sucker for a $5 piece of paper from days gone by with a great fonts, color schemes or messages. And then there's the St. Louis curiosity that's always bubbling below the surface. I bought this piece of paper marketed in exactly the way I described above. It's worthless, but not to me. This is actually a bottle label. Ritz Beverage. Huh, didn't ring a bell, but I'm always up for learning more about the city I love. The font got me and the Monopoly looking guy ready to profit on a "FULL HALF GALLON" of orange soda just dripping from the citrusy fruit is an eye catcher. And this monacled gentlemen didn't just pimp the Orange, he ran a strong Black Cherry and Grape game as well....and Lemon and Cream and Cola that was from a Seminole Recipe, made with Coca Leaves, but decocainized of course, to sate the puritans. 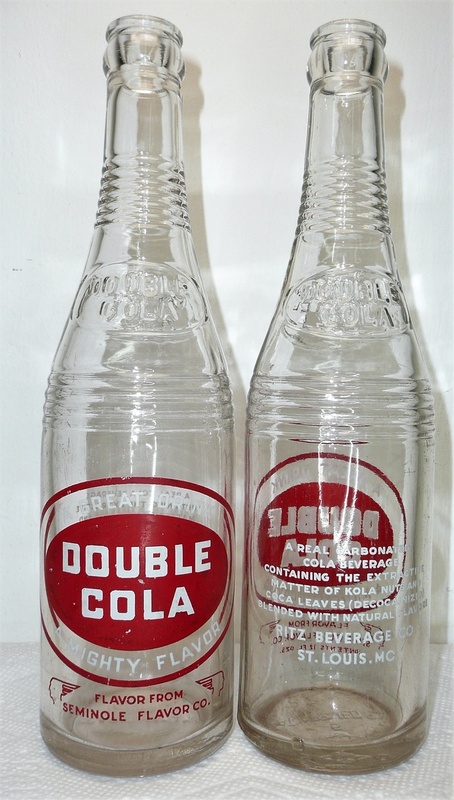 The bottles in the photos on Collectors Weekly ranged from 1936 - 1963. So where was this bottler and designer of handsome labels and bottles? Is the factory still there? Nope. I-44 and I-55 knocked out a huge chunk of the city and Ritz Bottling was one such casualty. The Interstate should have gone around St. Louis, not through. This was one of the most damaging things in our city's history. Brutal. Anyhow, I had to go to the library to check out if the address holds water. The ace librarian worked for maybe five minutes and pulled up a Sanborn map from 1951 when Ritz was still puttin' it on. The map clearly says "Bottling Works" at 1820-1824 S. 12th Street, so I'm calling it a win for Bottle-Bud at Collectors Weekly. Ritz Beverage was in the Soulard/LaSalle Neighborhood. Now to find some of those bottles.